This is the market near our apartment. It is in a huge indoor structure which the accompanying photo attempts to show. It is packed with fresh produce, butchered beef, pork, and chicken, and filled with tanks of water containing fish and creepy crawly things and things that slither. Quite an experience to walk through. Notice the woman wearing a heavy coat as she attends her stand; temperature is about 35° to 40° F.
A knock at our door announces the arrival of Mr. Shen. It’s 9:30 a.m. and he’s right on time. It’s Friday and our first morning in Hangzhou. Mr. Shen is an English teacher at Hangzhou Foreign Language School (HFLS), where my wife, Char, will be teaching. He does double duty as Director of Foreign Affairs. It also happens that he lives in our building and will assist us this morning with a brief orientation to our neighborhood. We step outside into a bright, sunny, mild (mild in that the air is still and the temperature is in the upper 30s) day with the city alive and humming and cars rushing along honking horns. We walk east along our street, Wen’er Road, a very wide four-lane road with 10-foot bike-and-motorbike lanes on either side. I have forgotten my backpack. I leave Char and Mr. Shen while I retrieve it. When I return, they are chatting about a former HFLS teacher whom they both know. We continue walking and then take a detour down an alley where Mr. Shen shows us where to deposit our trash. Back on the street, we wait to cross the wide Wen’er Road. The light changes to show the green icon of a person walking. We begin to cross and I quickly learn that this sign has a somewhat different meaning in Hangzhou than in St. Paul. At home, traffic stops and pedestrians cross the street. At home, pushing the nose of your car into the crosswalk might easily be considered bad form. In Hangzhou, the green walk signal means something more like, “Go ahead and cross the street, if you think you can!” Cars do not really stop. Pedestrians and vehicles engage in a kind of contest for the right of way. People and motorbikes and bicycles move among vehicles at 90° angles in an attempt to cross the street, each trying to determine who will pass in front of the other. I am amazed–especially when I see a man step in front of a city bus which doesn’t brake, but manages to pass within a foot of him as it continues its route. Now on the other side of Wen’er Road, Char and I look back at the frenetic traffic and bold pedestrians with jaw-dropping disbelief. No one is shouting. No one is making obscene gestures. No one is shaking a fist. No one is accusing anyone’s mother of being a woman of questionable reputation. Everyone takes it in stride. “We’ll have to get used to this,” Char says. “Yeah,” I say. Or die, I think. Mr. Shen guides us down a narrow street, noting with a sweeping gesture of his hand the massive brown building on the corner that is to be our landmark for finding this place again. Parked cars on either side of the street restrict traffic flow. Car and motorbike horns keep us constantly pressing to one side or another. I watch the Chinese in the street watch us. I begin to feel as if we are on display. I try to blend in, which is more or less impossible for me. I am a six-foot-three inch, 280-pound American of Austrian-Swedish descent wearing a bright red jacket. Even if I take off the jacket, I can’t disappear. I might as well be a walking billboard. We pass a bike repair shop, a fruit stand, a street-food stand, another fruit stand, and a rice stand. I look at six or eight gunny sacks of rice at the front, each opened to allow the buyer to see the product. Many other smaller sacks of rice fill out the stand. I have always thought of rice as long-grained or short-grained, white or brown. Today I learn I know little about rice. 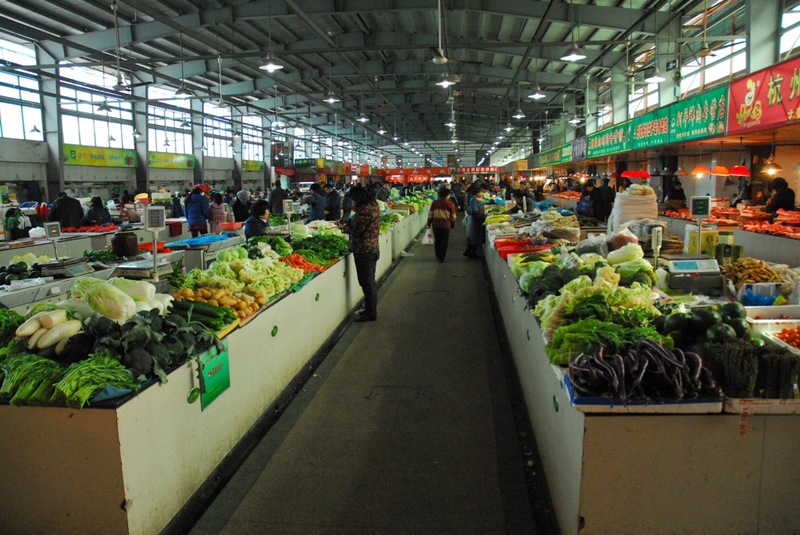 Full of produce, meat, fish and other seafood and living creatures, this market provides fresh food daily. It is quite large–I estimate about 250 x 100 feet. Mr. Shen leads us around another corner and after a few steps, passes through some heavy plastic strips that serve as a doorway through a concrete wall. We pass through with him and find ourselves inside an indoor market where shoppers come for daily fare. It is easily 250 feet long and 100 feet wide and full of freshly butchered meat–pork, beef, chicken and likely more–produce of all sort, and live food, such as fish, turtles, snakes, and shrimp. All sorts of other critters have been prepared for display and sale–but I don’t know what I am viewing. I really am in a different place, I think. I notice again that, even though we are inside, the building is not heated. Temperature difference between inside and out can only be a few degrees. All booth attendants wear winter coats, just as the shoppers. 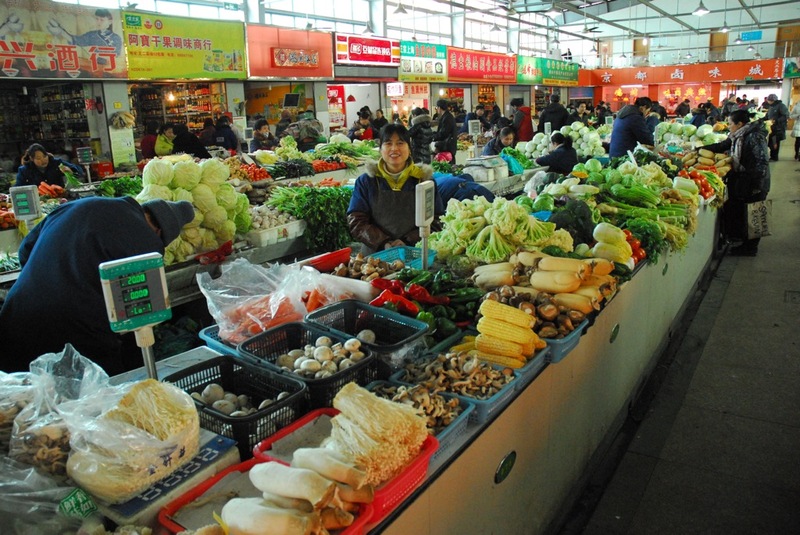 Markets and stores and shops in Hangzhou are not heated. Our orientation continues. Mr. Shen leads us outside again and around a couple of corners to a nearby convenience store. Inside, we find everything we will need to get started–everything from personal products, paper products, some household items, and groceries. We cross the street again to return to the apartment. We walk along Wen’er Road and Mr. Shen points out the many restaurants we pass. They truly are everywhere in our neighborhood. He enters one. We follow. A young girl greets him from behind a cash register counter. They speak a few words. Mr. Shen instructs us: “All you have to do is say ‘rice’ or ‘noodles,’ and they will bring it for you.” Something about this seems incomplete; we will discover that tomorrow. Again at the apartment, our formal orientation ends as Mr. Shen says good-bye. He and Bao have given us the basics; the rest is up to us. A short time later, we retrace our walk with Mr. Shen. In the market, we walk among the aisles. Having a fondness for cooking, Char and I experience a kind of sensory overload with the many possibilities presented by the food tables. We settle on some basics–broccoli, cauliflower, onions, ginger, and garlic. I point to a piece of pork on a block and indicate with my thumb and forefinger to the butcher to cut a piece about two inches. Effortlessly, his meat cleaver fulfills the request. Our first meal. 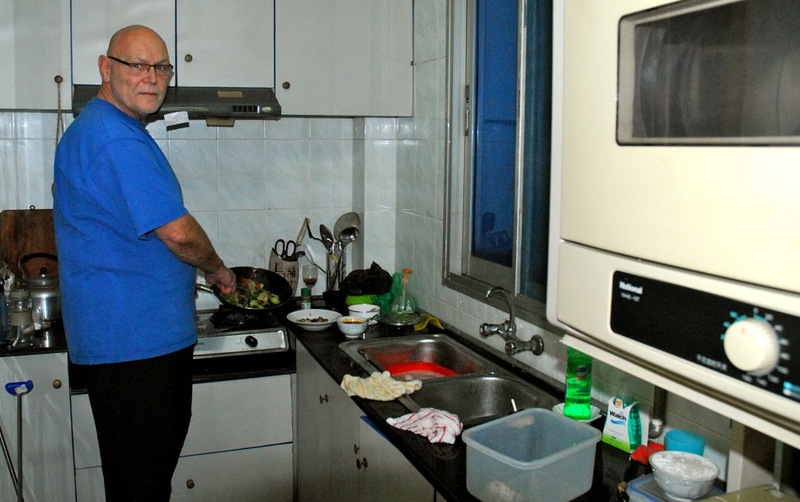 After a foray to the market and the convenience store, we prepare our first meal in the tiny kitchen of our Hangzhou apartment. It wasn’t half bad. At the convenience store we get a few odds and ends–paper products, sauces for cooking, some milk. Our routines start to take shape. Our anxiety diminishes somewhat. We take satisfaction in completing our first full day in Hangzhou. We feel our confidence building. I think Buster needs to open a VonHanson’s Meats in China! I agree. Complete with a well-stocked selection of California wines and a humidor! A little generous on your height, don’t you think? So interesting. You are managing well. I sent Margaux your blog site. Maybe she will have a few suggestions. I agree, Nate. I thought Ted was taller than Joe, so Ted must be 6′ 4″.